Participants may attend lectures at the University’s centres in Floriana, Sliema, Attard, Vittoriosa and Xewkija. 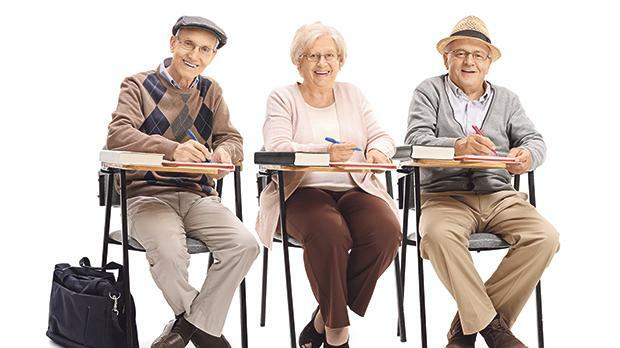 The University of the Third Age (U3A) will soon start accepting applications from people aged 60 and over who are interested in attending its 2018-19 academic programme. From Mondays to Thursdays between 9 and 11am at the Floriana U3A Centre, third floor, Catholic Institute, Floriana. The programme of lectures at this centre, which start on October 15, include: Anthropological perspectives on culture and human diversity; The science and humanity of geography; Kappelli u knejjes żgħar; Marine biology; 1960s music and popular culture; and Criminology. On Tuesdays and Thursdays from 5 to 7pm at the Sliema U3A Centre, St Patrick’s School, St John Bosco Street, Sliema. The programme of lectures at this centre, which start on October 16, include: An introduction to ornithology; Revisiting Shakespeare; and Geology: A journey to discover planet Earth. On Wednesdays from 9 to 11am at the Attard U3A Centre, Parish Centre, Main Street, Attard. The programme of lectures at this centre, which start on October 17, include: Il-Maltin tal-lum u dawk tal-imgħoddi; and Dante Alighieri – La Divina Commedia. On Thursdays from 9 to 11am at the Cottonera U3A Centre, Cottonera Resource Centre, St Edward Street, Vittoriosa. The programme of lectures at this centre, which start on October 18, include: Archaeological heritage of the Maltese islands; and France in the Maltese collective memory. On Fridays from 9 to 11am at the Gozo U3A Centre, University Campus, Mġarr Road, Xewkija. The programme of lectures at this centre, which start on October 12, include: Understanding paintings; and Ġirja ħafifa mal-istorja ta’ Għawdex. The full programme of lectures will be given on registration. Those interested in attending lectures at the Floriana, Sliema and Attard centres are to register at the Floriana U3A Centre as from September 24 onwards from Monday to Thursday between 9am and noon. To register for the lectures at the Cottonera centre, those interested are to visit the centre as from September 24, from Monday to Thursday between 9 and 11am. For lectures at the Gozo Centre, anyone interested is to call at Sylvana Pisani at the Care for the Elderly office, ground Floor, St Francis Square, Victoria from September 17 onwards from Monday to Thursday between 9 and 11am. The membership annual fee, covering the period from October 2018 to June 2019, is €12 payable by cash or by cheque addressed to ‘The University of Malta’. For enquiries, call the U3A Floriana Centre on 2124 3202 as from September 24 from 9am to noon.